Social networking is now in charge of who comes in and out of your blog, especially new blogs with no fame and SEO tools. Getting to meet your needs visitors’ matters cause they give to you what you give to them, this is where social networking comes into play. You no longer need to place your blog’s link over the internet or wait till you get recognized by google, all you need to do is go on social media and get it rocking. Yes, post daily and disturb your friends for views and in no time your little baby blog will be overflowing with visitors and google will even beg you to post. It’s that easy. What to do after getting the high traffic from the website or social media ( Facebook, twitter, and Instagram), Will you just let them come and go without commenting or viewing your posts? no blogger will want that. This calls for the usage of special blogger widgets (Twitter Feed Widget) that will keep your visitors updated on what you are currently posting on your social media accounts. Now this will definitely hold your visitors back and get them to read more of your articles without failing to comment. The Twitter Feed Widget, do not just hold your visitors back or keep them interactive, it also beautifies your blogger blog. Who wants to spend time on some ugly or unorganized blog? Nobody, with the help of the twitter feed gadget you can beautify your blog and change its design to suit all your visitors and readers. Twitter is a great social networking site that over the years has grown and inhabited millions of visitors or users. Twitter deals on tweeting, re-posting and also support link placement which stirs up a great way to advertise your weblog for free!!. But it won’t be that functional if visitors can not post to your twitter account straight from your blog. This is why “twitter feed widget” is important for bloggers. 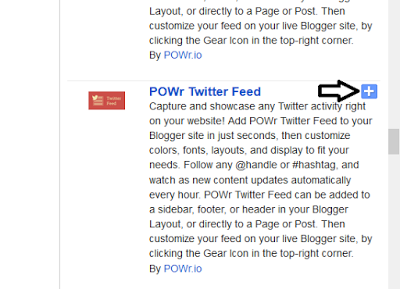 How to Add Twitter Feed Widget to Blogger. Before you can add a twitter feed widget to your blogger blog, firstly, you need to open a twitter account. Continue reading if you already have a twitter account. After that, the next thing you need to do is to visit the Twitter Feed Widget page. If you are already signed into your account, then it will show you the exact preview of the widget on your profile. There are lots of options for customization, you can adjust or change the size, shape, color and theme and also link color of the gadget. 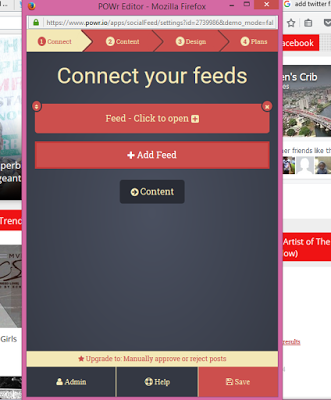 By default, the widget automatically takes shape and adjusts itself (Responsive), so you are always in safe hands. Once everything is done press ‘Create Widget” button and move to the next step. The perks of using Twitter recent tweets widget (embedded in Twitter Feed Widget) is not limited to just displaying the latest tweets. It also displays a follow button that allows your visitors to follow your account with just a single click. Additionally, it also allows your visitors to mention you in a tweet directly from your site. Aside from the above step to add twitter feed widget, you can also add specially designed twitter feed widget or plugin by POWr which doesn’t use HTML codes. It’s just a simple click and edit gadget. To start with head to your blogger dashboard and clink on “layouts” in the dashboard menu. A new window will come up, showing the skeletal design of your blog (Sidebar, Footer, and header). Choose which side you want your twitter feed widget to appear and clink on “Add Gadget”. A pop-up window will appear, clink on “more gadgets”. After it opens locate search and type in POWr now press enter. 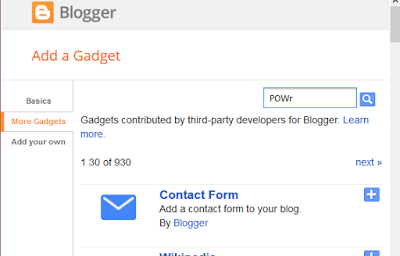 It will show results for the search with a lot of plugins you can add to your blog. Scroll down and locate twitter feed widget, clink on the + button beside it. Make little or no changes in the next window to appear. Press save. Now you have successfully added twitter feed gadget to your blog, all you need to do now is edit it and make it look unique. Visit your blog e.g. www.bloggingprince.com. When it opens locate the area where you placed the feed plugin, you will see twitter feeds from another account, locate a gear icon at the top of it. (When you place your mouse on it, it says “what’s this?”. Now clink on the Icon. A new window will show, take it away from where the twitter feed is showing so as you can see the changes while editing. 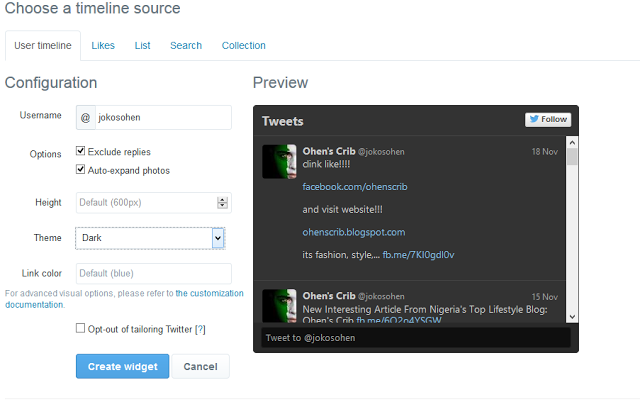 Click on add feed and then fill in your twitter name or any hashtag you want to use e.g @ohenscrib. Click on “content” to edit the number of tweets to be displaced. After editing click on “design” and also edit everything there. You don’t need to pay but should in case you want many more amazing features you can subscribe to one of the packages. Now hit save. A pop-up window will show informing you to sign up or sign in. If you already have a POWr account sign in but if you are new “Sign Up”. You have successfully added the magic working Twitter Feed Widget to your BlogSpot blog, with the aid of this gadget an impact would be made on your weblog traffic and impressions. The above-written content is a product of Obhiaba Blog and should in case any reader want to modify or use it, due credits should be directed to this post or blog. The Twitter Feed Widget was designed by the owners of Twitter for blog and website users. 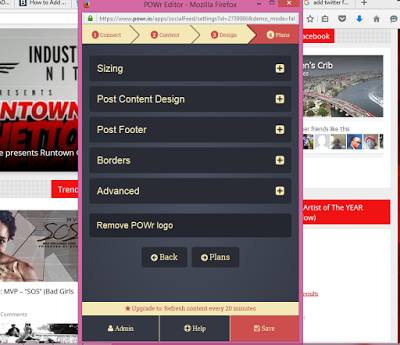 POWr is a great widget customizing tool which is also integrated to blogger. Should in case you are having any problems with installing this widget on your blog/website, simply forward a message across to Prince at the comment box bellow so as to get relevant respond in a jiffy. Need help in customizing your template and making it look like a professional blog? get it by contacting us via email or blog comment. I hope this small but usefully widget would help you in attaining some sorts of social exposure. If you have any question or query related to Twitter then, do not hesitate to leave a comment below i will try to guide you through your problems.